In 2015, the IRS issued proposed section 2704 regulations. The proposal would severely impact valuations of family held businesses that are the subject of gifts. On December 1, 2016, hearings were held in Congress regarding the impact of the proposed regulations. 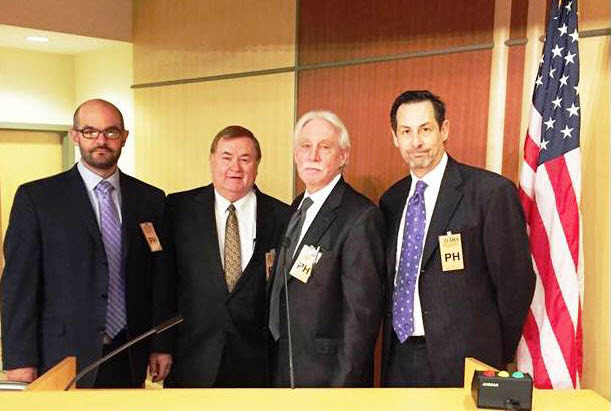 NACVA members, Peter Agrapides, Robert Grossman, and Mark Hanson testified at the hearing. In this article, Mr. Agrapides shares some of what occurred at the Congressional hearing. All eyes descended on Washington D.C. on Thursday, December 1, 2016 as the IRS hears testimony from a total of 37 speakers in response to the proposed § 2704(b) regulations, which were released on August 2, 2016. As one would expect, virtually all of those providing testimony were in support of either withdrawal or significant revisions, with 36 of the 37 seeking the remedies, and only one presenter asking that the proposed regulations be passed in their current form. Frank Clemente of the Americans for Tax Fairness advocated that Treasury and the IRS move forward with the proposed regulations to close what he perceived to be a loophole made available only to the ultra-wealthy. Mr. Clemente also argued that the proposed regulations are an important step to ensure a fair and balanced tax system. I should also note that, in addition to the 37 who provided oral testimony at the December 1, 2016 hearing, the IRS received over 9,000 written comments over the three-month comment period. The Treasury/IRS panel consisted of Catherine Hughes (Attorney-Advisor in the Treasury Department’s Office of Tax Policy), Charlotte Cheyl (Special Counsel to the Associate Chief Counsel of the Internal Revenue Service), Leslie H. Finlow (Senior Technician Reviewer at the Internal Revenue Service), and John D. MacEachen (Senior Trial Attorney at the Internal Revenue Service). Congress enacted Section 2704 in 1990, to prevent the perceived abuse by taxpayers who artificially depress the value of interests in family-controlled entities for transfer tax purposes. Section 2704 attempts to limit the availability of valuation discounts for transfer tax purposes in the case of intra-family transfers of interests in family-controlled entities by disregarding restrictions that would normally be considered when determining the fair market value of an interest if two conditions exist: (1) the restrictions limit the ability of the entity to liquidate, and (2) either the restriction lapses (entirely or partially) following the transfer, or the transferor or the transferor’s family can remove the restriction (in whole or in part). Despite the limitations presented by Section 2704, through careful navigation of the rules under current law, estate planners are able to structure highly tax efficient estate freeze transactions that are “supercharged” through the use of valuation discounts. For many years, practitioners have braced themselves for an overhaul of the estate tax planning and resultant valuations associated with intra-family transfers. Section 2704(b)(4) authorizes Treasury to issue regulations that would disregard other restrictions in determining the value of a transferred interest in a family-controlled entity to a member of the transferor’s family, if the restriction has the effect of reducing the transfer tax value of the transferred interest, but does not reduce the true economic value of the transferred interest in the hands of the recipient. Estate planners have braced for change since 2003, when Treasury and the IRS first included a regulations project under Section 2704 in their Priority Guidance Plan. Exacerbating these fears, from 2009 through 2012, the Administration’s Greenbook has also included recommendations to clarify or enlarge Treasury’s authority to disregard other restrictions through regulations, as a budget proposal for Congress. This culminated in the release of the Proposed §2704 on August 2, 2016. Most of the speakers asked for complete withdrawal of the proposed regulations. The speakers that asked the Treasury/IRS for withdrawal noted, as we did in our letter to the IRS, that there were simply too many problems with the proposed regulations, as currently drafted, to warrant amending section-by-section amendments. Most speakers asked that operating companies not be covered by the regulations. Many speakers brought up “real world” examples of families that do not act in accord with one another. I think the most poignant example was made by John Porter, Esq. (Baker Botts, LLP). Porter litigates some of the most high-profile cases that go before the U.S. Tax Court and I found his testimony to be interesting as well as compelling. Other speakers echoed the point made by Mr. Porter (that families do not always get along), including the speakers from the American Business Defense Council, the S Corporation Association, and the Family Business Coalition. Other speakers pointed to the fact that an additional estate tax burden will have the effect of hurting small business, which based off of statistics quoted at the hearing, employ between 66% to 72% of the U.S. population. Some of the more technically intense testimony was that of Stephanie Loomis-Price, Esq. (speaking on behalf of the American College of Trust and Estate Council [ACTEC]). She pointed out various inconsistencies that would be created if the regulations were passed in their current form. Other speakers echoed this sentiment, namely the basis-inconsistency issue that could be created by essentially using “minimum value” as the standard of value for Transfer Tax (Gift, Estate, and Generation-Skipping Transfer Tax) purposes, and traditional “fair market value” as the standard of value for income tax purposes (e.g., a valuation of closely held stock for charitable donation purposes). Out of the 37 presenters, two were business owners, as opposed to professional advisors or lobbyists. The first businessperson to testify was Charlene Law, who owns a motel in Jackson Hole, Wyoming. Clarene Law provided a very moving history of her life as a business owner. She was the thirteenth individual to testify, and by that point, much of the testimony had become redundant. She took the stage and opened with the line, “I guess I am who you all have been talking about.” She recounted how she went into the motel business when she was 28 years old in Jackson Hole, Wyoming. She noted that her parents provided her the funding, consisting of $10,000, a large sum at the time. She noted how she started the business and has grown it to an enterprise with 450 rooms and over 100 employees. Law went into detail regarding her community involvement and noted that there is a lot of private equity money in Teton County, Wyoming, and noted that they provide a great deal of money, but no community of philanthropic involvement. She articulated her desire to pass the business on to the next generation, but was worried that if the proposed 2704 regulations were enacted, it would be difficult, if not impossible, to pass it on, and that she may have to sell the company.The second businessperson to testify was Jamie T. Richardson, representing White Castle Management Co. He presented testimony as the fourth-generation owner of the Midwestern burger establishment. Mr. Richardson concluded by stating that family business owners are “hungry for simplification” and ardently requested the Treasury and the IRS to withdraw the proposed regulations, or at least revise them, to provide a cleaner, clearer path in navigating the tax code. Kevin Kester, of the National Cattlemen’s Beef Association, who was a cattle rancher from Parkfield, California, discussed the negative economic impact the proposed regulations would have on those in the agricultural sector, namely farmers and ranchers. He noted that businesses in the agricultural sector are “land-rich and cash-poor.” He provided an example of the difficulties his cattle-ranching operation (a multi-generational business) had when his grandfather died. He noted that all available free cash flow went to pay the estate tax and the business went without capital infusions for equipment replacement and repair, and that it was difficult for the business to make payroll and other day-to-day expense obligations. A couple of other presenters, namely Carol Warley (Texas Society of CPAs), noted that the proposed regulations run contrary to long-standing legal precedent. Catherine Hughes (IRS) made a point to note that it was not the intention of Treasury/IRS to eliminate the application of discounts for lack of control, and that, if the regulations are revised or put into final form, they would be much more clear on the discount for lack of control applicability issue. The AICPA had two speakers. It was interesting to note that they have not yet submitted their formal written response. Apparently, the IRS is ok with this and the two AICPA speakers—Justin Ransome and Michelle Gallagher—noted that it is “in progress” and will be sent to Treasury/IRS. NACVA was the most heavily represented group, having three speakers—myself, Robert Grossman, CPA, ABV, ASA, CVA, MST, CBA; and Mark Hanson, CPA, ABV, CVA. With a total of three presenters, we were able to discuss, in great detail, every point made in our formal narrative submission, which was sent to the Treasury/IRS. It should also be noted that Robert M. Weinstock, JD, MBA, CVA, was an instrumental member of the Legislative Team that put together NACVA’s formal narrative submission. Weinstock spoke on behalf of his firm, Strategic Valuation Group, LLC, articulating the fact that families oftentimes do not get along when running a business enterprise. I came away from the hearing with the general feeling that it went well and was a meanwhile endeavor. I felt like our concerns were validated by the panel, and was encouraged that the panel addressed what most viewed as the most egregious features of the proposed regulations. Also comforting was the fact that those in opposition to the proposed regulations spoke with one voice and hammered home the overall shortcoming of the proposed regulations and the need for immediate withdrawal—or, at a minimum, a total overhaul. Except for the comments made by Ms. Hughes, the panel was extremely tight-lipped. Selfishly, I was hoping to walk away from the hearing with more information from the IRS, but I cannot say that I am surprised. As of current, we are in a holding pattern, eagerly anticipating the Treasury and IRS’ next move.